Bambi is the pseudonym of a contemporary British street artist. Her works focuses on contemporary female identity and its relationship to patriarchal culture. She also keenly highlights political and social injustices. 'Bambi' is derived from the childhood family nickname 'Bambino' and is a popular artist within the show business world. Known collectors of her work include Rihanna, Brad Pitt, Adele, Robbie Williams, and Take That’s Mark Owen. Bambi's stencilled work is frequently described as gritty and masculine in appearance whilst exploring themes of feminism, popular and street culture. Bambi is recognised for her stencilled graffiti and has created various works across London. Bambi first gained attention for her 2011 piece 'Amy Jade' a tribute to the late singer Amy Winehouse in Camden and 'Diamonds A Girls Best Friend' depicting a young Queen Elizabeth II as the Queen of Diamonds, as featured in Time Magazine in 2012. In her first Italian solo show, Bambi exhibited during the 57th International Venice Biennale. Whilst in the historic city Bambi revealed a water front piece 'The Pope Gives Us Hope'. Featuring the Pope reaching out to a polar bear in a capsizing boat, the work is designed to reflect the Pope's comments in late 2016 on climate change, and his call to end environmental destruction. Bambi's identity is a well guarded secret with the artist withholding much information about her personal life. In a 2014 Daily Mail interview Bambi did reveal that she studied at the City & Guilds of London Art School, in Kennington, South London before gaining an MA from St Martin's School of Art. In 2010, the vandalism of a popular Bambi stencil in Primrose Hill re-ignited the long running London debate over the preservation of street art and resulted in Islington Councillors proposing a community committee be established to rule on the future protection of street art. In early 2011, Bambi commemorated the royal wedding of Prince William and Kate Middleton with the satirical slogan 'A Bit Like Marmite' across their chests. In 2014, Artnet News named Bambi as one of their Top 20 Art World Women of 2014. The list included artist Marina Abramovic and singer Beyoncé. For her first piece of 2017, Bambi received international critical acclaim for her politically inspired piece 'Lie Lie Land' which features a dancing Theresa May and Donald Trump in the pose made famous by the movie 'La La Land'. On 31st of August 2017, on the 20th anniversary of Princess Diana's death, Bambi unveiled 'Be As Naughty As You Want'. The piece presents Princess Diana as Disney's Mary Poppins being carried into the sky by her magical flying umbrella, watched by Prince George and Princess Charlotte. © If artwork shown on ArtFair is already sold or unavailable for immediate sale, we'll do our utmost to source a similar edition for you. ArtFair is a trading name of LeadFair Ltd. Co. Reg. Number 08565869. Reg. Address: Swift House, 18 Hoffmans Way, Chelmsford, Essex. CM1 1GU. Registered in England and Wales. VAT Reg. No. 169725662. Registered with the Information Commissioner's Office: Data Protection Reg. No. ZA025012. Artwork prices can go up or down. ArtFair offers fine art, contemporary art, urban art, pop art, and modern art through our own collection and our global network of art gallery partners, art dealers and private collections. 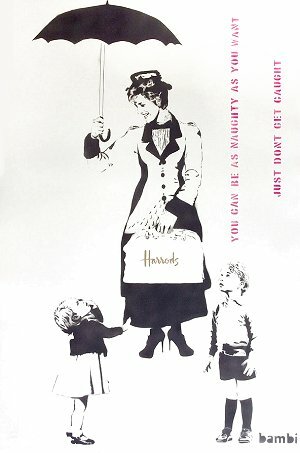 Keywords: Bambi Art For Sale, Be As Naughty As You Want, Princess Diana, Disney's Mary Poppins, umbrella, Prince George, Princess Charlotte.